Rotary displacement pumps: Positive displacement rotary pumps rely on fine clearances between moving parts for their efficient operation. Excessive wear or erosion of parts, due to friction contact or the presence of abrasives, is avoided by employing this type of pump for specialized rather than general duties. 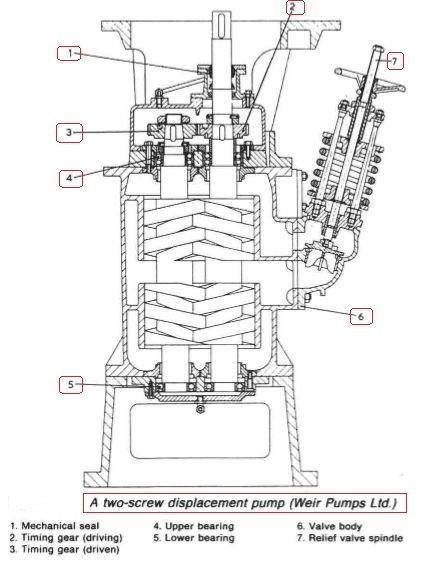 Contact between elements in some screw pumps (Figure 1) is made unnecessary by gear drives. When used for lubricating oil and hydraulic systems, rotary displacement pumps benefit from the sealing effect and provision of lubrication between parts. For a rotary positive displacement pump operating at zero pressure the volumetric efficiency should be 100% but as the differential pressure increases the amount of leakage (slip) through clearances will increase. This slip (the terminology normally used) will naturally be less the more viscous the pumped liquid is, for any given pressure. It should also be noted that the slip, being a function of the clearance, viscosity and differential pressure, is constant irrespective of running speed. In practice, changes in flow conditions affect this slightly. The power requirement of the pump may be split into two components, namely hydraulic power and frictional power. The hydraulic power is that required for the pumped medium. Since slip is only 'slip' because it has been pumped and then leaked back via the clearances, it is only necessary to consider the pump displacement at its running speed, and the differential pressure through which the liquid is being raised. Frictional loss is minimal where rotors are not in contact. These are by far the greatest losses in a rotary pump and the liquid properties are beyond the designers' control. This leaves only the distance of movement of the dynamic unit and speed within the designers' control (acceleration is a function of both). Depth and form of tooth influence this in a gear pump. With the screw pump, the pitch of the screw is the major factor. Thus high helix angle screws can be used up to a relatively high speed on small pumps, and lower helix angles on larger pumps, to keep the pitch within limits set by the field requirements for suction performance.